The show that empower yow to redefine the life you want and live your best life now! Hi, I am Francine Beleyi, your host! I’ve found that so many professionals even those with a high-powered job, sometimes struggle to find meaning in what they do at work and also fail to live a meaningful life. They spend years or decades in a job they don’t find fulfilling. They are simply not happy, regardless what others may consider signs of success. Where do you turn to find a solution to your situation when others consider to have it all? I’ve been there many times and my search for a solution led to me to insightful discussions with a wide range of people across all walk of life with different levels and form of success. I share some of the insights I’ve gathered throughout this search in my first book ‘Personal Branding in the digital age: how to become a known expert, thrive and make a difference in a connected world’, available as ebook, paperback and audiobook on Amazon, iTunes, Audible and other online book stores. There are 7 pillars but the Pillar #1, Know yourself, is really where it all starts. It is the foundation. There is no defined or standard way to measure success at work and in life. The definition of success and meaning varies widely from one person to another. People are motivated by different things in life and the paths to get there are also very different. 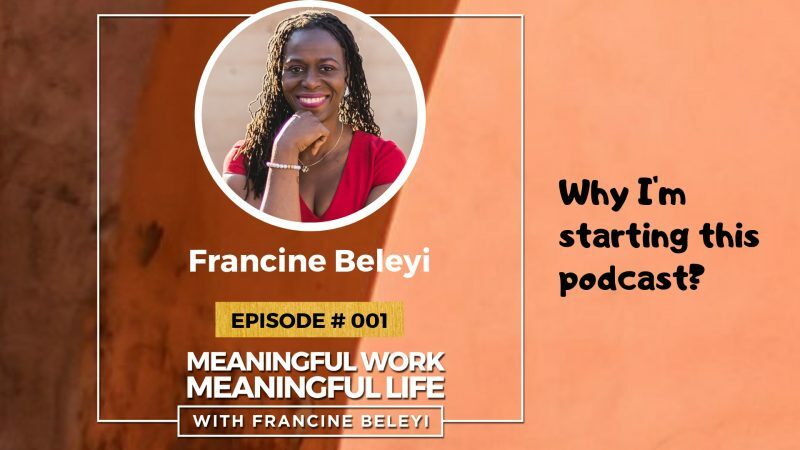 What is MWML Meaningful Work, Meaningful life podcast? Meaningful Work, Meaningful life podcast is a conversation I have with top authors, coaches, speakers, entrepreneurs, CEOS, thought-leaders and other inspiring professionals who are doing meaningful work and living a meaning life. These women and men are doing things beyond themselves; they have a cause or a vision that gather momentum and inspire others to join in to take that vision or cause to the next level. or if you are simply looking to do more amazing things, then the stories you’ll hear in this podcast will inspire you, energise you and help you to live the life you want. Movement (how are they impacting others). I’ve talked to a wide range of people: Blockchain expert, authors, coaches, speakers, Impact investor, CEOs, Chief happiness officer, Negotiation expert and Forbes contributor, Media/TV producer and many more. There is no right or wrong way to go about finding meaning. What worked for some people may or may not work for you. But I hope that at least one story will resonate so much with you, energise you and help you with a renewed sense of possibilities on your own journey! The show notes of the episodes of the podcast are available here at www.francinebeleyi.com/podcast with all the references and resources shared during the show and whilst you are there join the conversation happening on my blog. I have something special gift I‘d like to give you to celebrate the launch of this new podcast. 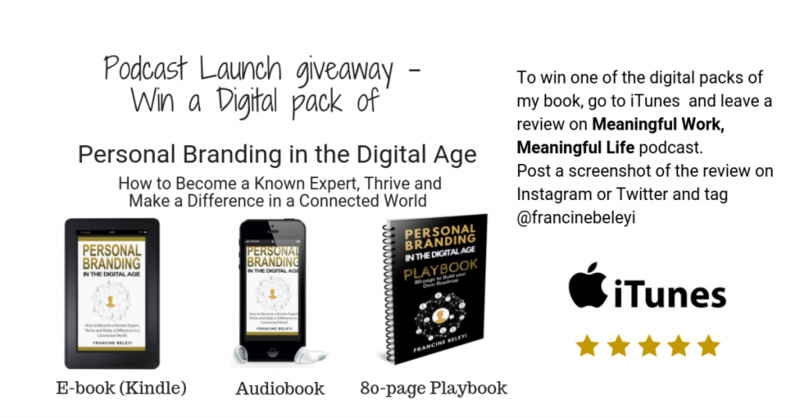 I am giving away ‘digital pack’ of my book Personal Branding in the digital age to quick start your success in 2019. It includes: A eBook copy, an audiobook copy and an editable Playbook to create your personal brand roadmap. For your chance to win one of the digital packs of my book, go to iTunes and leave a review on Meaningful Work, Meaningful Life podcast. Post a screenshot of the review on Instagram or Twitter and tag @francinebeleyi. Another way to win one of the digital packs is to comment below the post of the episode here and tell me your key takeaway and what one thing you’ve decided to do this year to have more meaning in your life. Maybe you’ve decided to write a book, launch a new product or get paid more. I’ll look through the comments to pick the winners and will send you the full digital pack of Personal branding in the digital age to help you quick start 2019 and smash your goals. If you like what you’ve heard, head over to iTunes, SoundCloud, or the app where you are listening this podcast to leave me a 5-star review to show your support and appreciation. It will take you a minute, but it will mean a lot to me and help me to know that it is serving people out there.